The political earthquake we are living through has barely begun: expect more shocks through the summer and autumn. After Angela Eagle’s withdrawal the Labour leadership contest has snapped into focus, with Owen Smith as the sole challenger to Jeremy Corbyn. Amidst all the sound and fury it has never been more important to get some perspective. Where do Labour’s scattered tribes and leaders now stand politically – and can they ever be reunited? First developed in the US, Crowdpac’s unique algorithm maps political positions based on objective data and millions of political signals. We have now applied this model to UK politics, including big-data analysis of social network supporters. The results are striking. The model identifies a diversity of British political positions, ranging economically from left to right and socially from liberty to authority. This data illuminates the landscape even for me, as someone who once stood to be General Secretary of the party. Jeremy Corbyn is to the very left of the spectrum, and socially very liberal; in fact, his position according to our data appears very close to that of Green leader Caroline Lucas. 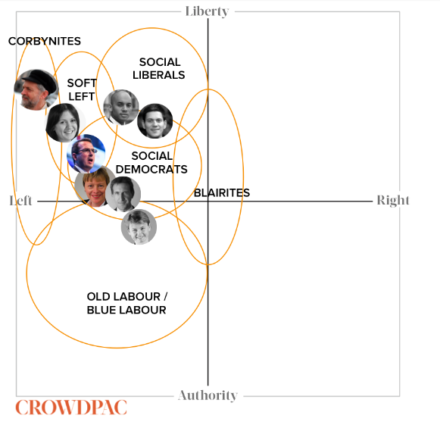 David Miliband and Yvette Cooper are also both on the left, but much more centrist in their positions, with Miliband leaning more toward liberty and Cooper more toward authority. 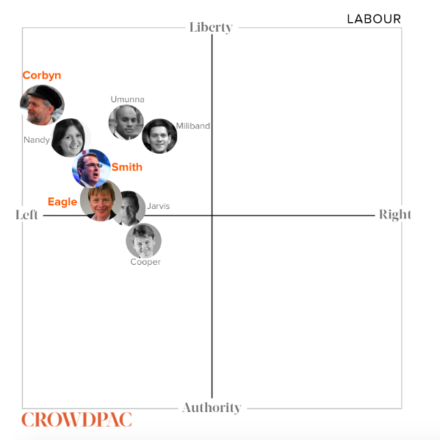 Owen Smith and Angela Eagle’s positions are quite close, but both clearly well to the left of centre, with Smith leaning a little further toward both liberty and the left than Eagle does. Lisa Nandy, often mentioned as a champion of the “soft left”, is in between Smith and Corbyn. Chuka Umunna looks closer to David Miliband, and ex-soldier Dan Jarvis is positioned between Eagle and Cooper. By answering a simple questionnaire on our Political Matchmaker, you can also find your own position on the map, compare yourself to these and other leaders, and support those with whom you agree. Reflecting the polls, Jeremy Corbyn has taken an early and considerable lead on Crowdpac, with 49% of endorsements. Remarkably, David Miliband is tying Owen Smith for second place, although he hasn’t entered the contest and remains in American exile – both are on 16%. Yvette Cooper has 9% of endorsements and Angela Eagle 7%, with other possible contenders well behind her. You can see the running total of endorsements along with other data on our Labour leadership contest page. While our data on the leaders’ positions shows clear differences, they are overwhelmingly clustered in the “Liberty Left” quadrant of the map. No traditional “Blairites” appear here: David Miliband is the closest to that position, but seems to be more of a liberal social democrat. Our data has previously found Tony Blair and most of his closest supporters clustered around the centre lines between left and right, liberty and authority. “Social democrats” include leaders like Ed Miliband and Gordon Brown who were to the left of the Blairites. “Social liberals” are more inclined toward liberty and cosmopolitanism, and the “soft left” stand a little to the left of both these groups. Most leaders in the parliamentary Labour party now fall into one of these three categories, although a significant number of Labour MPs still lean more toward authority and the “Old Labour” / “Blue Labour” worldview (one younger example is Jamie Reed). Jeremy Corbyn won last year’s leadership election not only by registering large numbers of Corbynite supporters, but crucially by winning the support of many soft left and blue Labour and union members, who were unimpressed by his three rivals and attracted by “straight-talking, honest politics”. The views of these swing voters will now be crucial, as will those of tens of thousands of newly registered £25 supporters. The outcome of the leadership election will ultimately hinge on three factors: political positions, character, and strength. Owen Smith aims to reunite Labour by offering stronger leadership, a better chance of victory and a bold mix of policies. He is appealing to disappointed Remainers and social liberals with the idea of a second referendum on the terms of Brexit; to Blue Labour types with a “progressive case” against untrammelled free movement of labour; and to the left with proposals like a £200 billion New Deal for public investment. The Corbynites are countering with their own proposals for a £500 billion stimulus, supported by a National Investment Bank and a network of regional banks. Their success may depend on articulating a left-wing strategy for the economy which is substantial, credible and broadly appealing. But their strongest suit could still be character. Corbyn’s apparent authenticity and long-standing commitment to left-wing values will be played up and contrasted with Smith’s background, while Corbyn’s opponents try to spotlight his flaws. Whoever wins the leadership election, their greatest challenge will be reuniting the scattered tribes, all of which have historically been essential pillars of a winning coalition for Labour. A rebranded UKIP, likely led by Mancunian Steven Woolfe, will challenge hard for the Old and Blue Labour vote in the heartlands. Theresa May’s One Nation conservatism could also make inroads, the Liberal Democrats are reviving, the Greens could prosper under Caroline Lucas, and new electoral movements and alliances are afoot. The fragmentation of the left vote is already accelerating, and the earthquakes have only just begun. If this leadership election fails to resolve the current civil war in Labour, the options are paralysis, another challenge, or a split. But whether Labour stays together or breaks apart, the success of the left will depend on its ability to unite an increasingly diverse coalition. Even if Labour splits into a socialist and a social democratic party, they will still need to find ways to work together electorally if they are to avoid annihilation. Whatever happens, all wings of the left must put in serious work to renew their relationship with an increasingly unimpressed public. Fresh leadership, a team spirit, robust debate on creative policy ideas and an effective combination of internet and community organising will all be essential.